Figure 1 Data source: National Centers for Environmental Information 2016c. Last year was the wettest year ever in the Contiguous United States, according to data from the National Centers for Environmental Information (NCEI). In Figure 1 the blue bars show the percentage of the country that was very wet (wettest 10% of years), and the red bars below the line show the percentage of the country that was very dry (driest 10% of years). In 2015, 36.15% of the country was very wet, the largest percentage since record keeping began in 1895. None of the country was very dry, which has happened 3 other times since record keeping began. Figure 2 Source: National Centers for Environmental Information 2016b. Precipitation varies from place-to-place, however. Figure 2 show precipitation across the country by NCEI Climate Division. It was drier than average in parts of California, the Northwest, and New England. Much of the rest of the country was wetter than average. Regions in Texas, Oklahoma, Kansas, Iowa, and North Carolina had their wettest year ever. On this map, the dark green (wettest year ever) and medium green areas (much above average) correspond to the very wet percentage in Figure 1. Figure 3 Source: National Centers for Environmental Information 2016a. 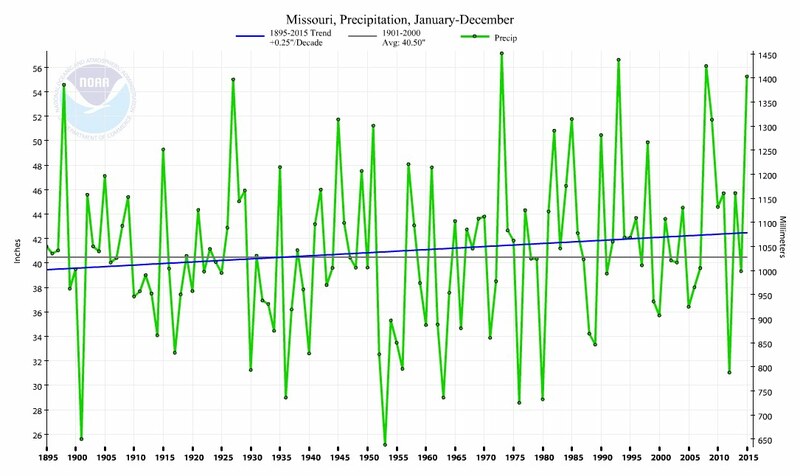 In Missouri, 2015 was the 4th wettest year since 1895. Starting in 1981, 21 out of 35 years have seen above average precipitation. The blue line shows the linear trend since 1895. The trend equates to a 0.25 inch per year increase each decade. Most future climate models show the Eastern United States getting wetter, and the Western United States getting drier. Missouri is near the boundary, and climate modeling has had a lot of uncertainty. At this point, the trend is towards wetter. Figure 4 Source: National Centers for Environmental Information 2016b. Figure 5 Source: National Centers for Environmental Information 2016a. When I look at precipitation, I look at two other regions of the country besides Missouri. First, I look at the Northern Rockies and Great Plains. I look there because it is the source of the Missouri River, the largest source of potable water in Missouri. 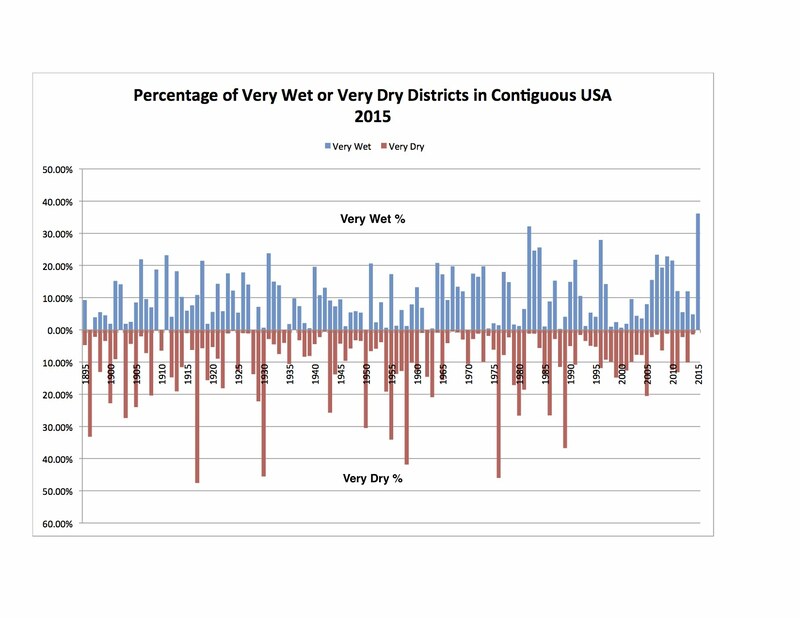 Figure 6 shows that 2015 was a moderately above average precipitation year in this region. The blue line shows the trend, which has been increasing by 0.06 inches per decade. 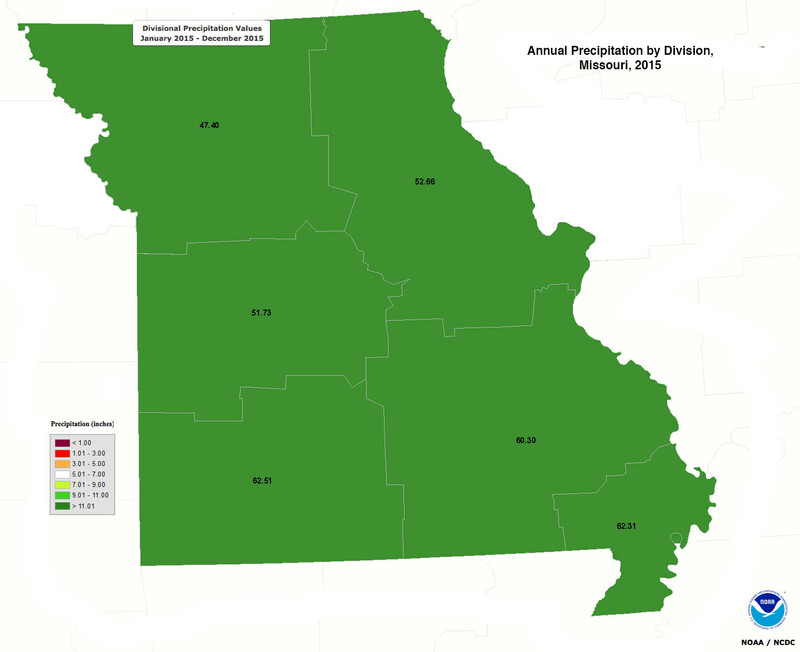 Compare the less than 20 inches of precipitation in this region with the more than 60 inches across Southern Missouri. This is a drier, but not desert, region. Figure 6 Source: National Centers for Environmental Information 2016a. The other region I look at is California, because of my interest in the drought there. Figure 6 shows California precipitation through 2015. It was the 13th driest year since 1895. 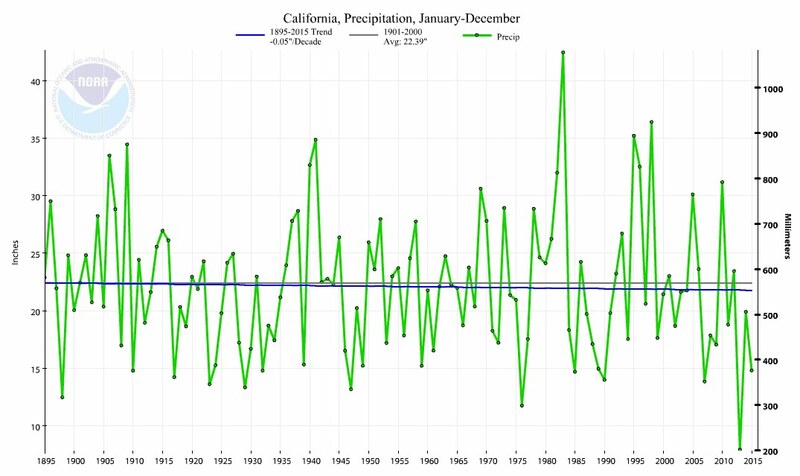 The trend shows that California has been receiving 0.05 inches less precipitation each decade since 1895. In December, a strong El Niño weather pattern began bringing increased precipitation to California. It was too late to drastically affect the statistics for 2015, but 2016 may be a better water year there. National Centers for Environmental Information. 2016a. Climate at a Glance. Data retrieved 1/10/16 from http://www.ncdc.noaa.gov/cag/time-series/us. National Centers for Environmental Information. 2016b. National Temperature and Precipitation Maps. Data retrieved 1/9/16. http://www.ncdc.noaa.gov/temp-and-precip/us-maps/12/201512#us-maps-select. Select Year = 2015, Month = December, and Timescale = 12-Month. National Weather Service, St. Louis, MO, Weather Forecast Office. 2016. December Historic Rainfall and Flooding Event Review. http://www.weather.gov/lsx/12_26_2015. By mogreenstats in Climate Change, Weather Patterns on 2016/02/09 . 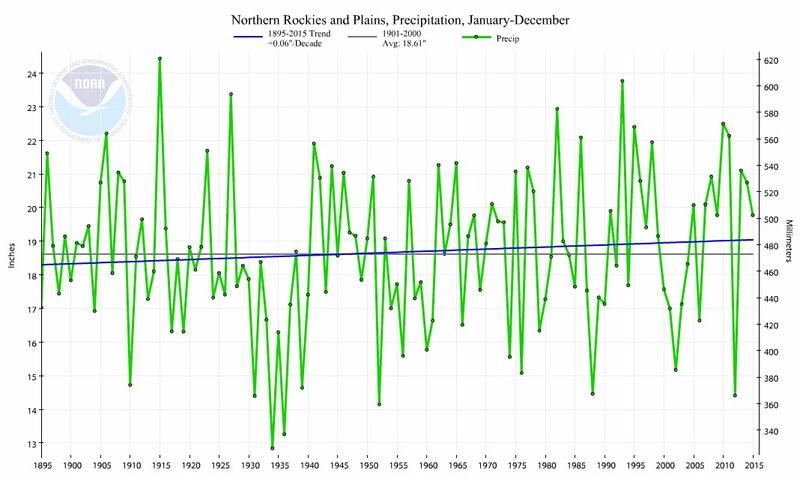 Figure 7 shows precipitation for 2015, doesn’t it? Not 2016. Just in case you thought I wasn’t keeping up! Yes, you are correct. It turns out that the Figure was also Figure 6, not Figure 7. Thank you for the correction.